Woo hoo! Sold my first cake (writer's note: now I've sold three)! Going pro after all these years of amateur status. I bake for many reasons (the order of importance varies widely): to show love, to make friends, to feed hungry people, to feed me, to do something productive, to feel accomplishment, to change my mood, to calm me down, to taste the batter, to challenge myself, to try something new, to justify a cookbook purchase......I could go on. I'm living in basically paradise, but winter's just over and spring is new and even though it's mild (usually 60-70 F during the day) it's almost always cold in our apartment without central (or any, really) heat. It's nice to run the oven just for a little extra warmth. It's also good to work in the kitchen in the evening so I don't just fall asleep watching television or Netflix (currently binge-watching Parks and Rec). And no matter the weather, I can always use more friends. Baked goods are excellent ice breakers. Plus, I definitely need someone to eat most (if not all) I bake because paradise requires wearing swim wear and Australian paradise pretty much requires that to be of the two-piece variety or a wetsuit which is possibly even less friendly than a bikini. Anyway, I've never baked for profit to this point. And even though I'm selling baked goods to my favorite cafe on a pretty casual basis, going pro in a highly semi-pro way, it's clearly not about the money. A little pocket money will be fun, but baking for resale will be something new to do and truly it will simply be something to do. Currently weekly orders of peanut butter snack cake and weekend dinner service orders of creme brulee cheesecake are on my baking schedule (along with these muffins because they are favorites). You would think with all this free time my empty nester expat life affords that I might have written a few more blog posts. Up until a few weeks ago, I just couldn't get comfortable in my apartment kitchen. But I've been back from two trips home to the states for over a month now and the whole thing is feeling more like home, not just the kitchen. It's still a very dark and fairly ugly space, but the appliances and I have a better relationship now and I'm pretty good at overlooking things I can not change. I have yet to find attractive options for photos, so for now you will get mainly photos off my iPhone. I need to construct a good white space for photography and that just may never happen here. The joys of living some place that's not your own. But I do have a warming drawer. There's that. I love that thing. Since most of you are about to enter the cool weather, here's a semi-pro tip for you: warm your plates (and serving bowls, if appropriate) before serving dinner. The warming drawer is perfect for this, but a quick microwave (if microwave safe) or a good running under hot water works too. You've bothered to assemble a delicious hot meal and it would be tragic to have it quickly cooled from a cold plate. That is for sure my favorite thing about my kitchen. Well, that and my kitchen is just a few hundred yards from the Tasman Sea/Pacific Ocean. Do you want a recipe? You know, I might get around to that for you. That is the whole point of this blog. (I do have the other one for expat musings). One of my cookbooks that made the trip down under, is "Huckleberry" from the cafe/bakery in Santa Monica. The cover features a brioche loaf with a fresh blueberry swirl which I have yet to make because that swirl would cost me about $20 here (blueberries are crazy expensive no matter the season). But I have made the brioche which is lovely. And I've made a vegetarian tartine with a brilliant bechamel sauce that employs a jalepeno. I will share it. You may have to remind me. The current favorite from the book is this muffin. I've changed it just a bit based on ingredients I can easily find. The muffins are not too sweet and are full of nutty tasting good things, but the best part is the crumble topping. It's so good, I've actually made it into a granola recipe which is a little bonus at the end of the post. Because the tops crumbled into my morning yogurt with fresh blood oranges and strawberries were a happy accident that is now a regular routine. Don't let the millet put you off. It is pretty funny that I spent lots of money buying deluxe bird food for our backyard birds in Indiana, deluxe usually meaning a low percentage of millet, and now I am buying lowly millet it from the bulk bins to use in my baked goods for humans. One more little side note. I can not find kosher salt in Sydney. Closest thing would be sea salt, but the crystals are massive and I think must be ground to add to baked goods. On the other hand, finishing salts are plentiful and not expensive. Maldon flaky sea salt is actually much cheaper here. Neither here nor there, but an interesting side note (at least to me). Bake on. Preheat oven to 350 degrees. Spray 12-cup muffin tin with nonstick spray or line muffin cups with papers (which just seem silly if your baked goods are being consumed at home). When you are measuring out dry ingredients for the crumble topping, go ahead and measure out the dry ingredients for the muffins too because there are a lot of duplicates. Just a timesaver. Make the crumble topping combining all crumble ingredients in a small bowl and blending them with your hands (warms up the butter) and helps form the crumbs. Set aside. You will have to wash your hands with nice hot soapy water (which you should already be doing in the kitchen), but before you do, feel free to have a taste of that crumble. Yum..
To make the muffins, in a large bowl whisk together the dry ingredients: whole wheat flour, almond flour, wheat germ, millet, chia/poppy seeds, flax seeds, oats, cinnamon, baking powder, baking soda, brown sugar, sugar and salt. In a liquid measuring cup or in a small bowl, whisk together the butter, honey, buttermilk, canola oil, egg and vanilla extract. Pour the wet ingredients into the dry ingredients and fold together with the grated apple just until combined. 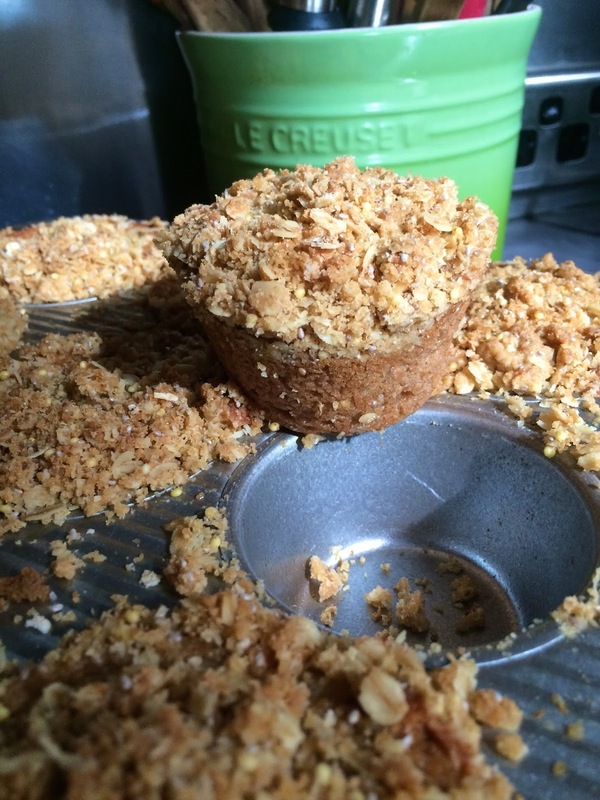 Fill muffin cups to the top (or pretty close) and top with evenly distributed crumble. Bake for 20-22 minutes, or until a tester comes out clean and or the center of the muffins springs back when lightly pressed. Cool in pan for 5-10 minutes before carefully lifting muffins out to continue to cool on a cooling rack right side up (you don't want to lose the crumb topping). Bonus recipe a modification of the crumble topping. Melt the butter and stir in the sugar and honey. Toss with all dry ingredients and modify to taste. You may want to add some canola or other oil (coconut oil would be tasty) by the tablespoon if your granola is too dry. You can always replace the butter with oils of your choice. Add the cinnamon if you want. Add some almonds or walnuts or sunflower seeds. After baking, toss in some dried fruit of choice. Spread the granola evenly on a baking pan/sheet lined with parchment and bake in a 325 degree oven for about 15-20 minutes, stirring so it evenly toasts but does not get too brown. Store in an airtight container. Hehe. Note this whole bag of indoor bird food is $1 AUS. Look at all those little pearly grains of millet. Side note. Men's Speedos are aka as "Budgie Smugglers" in Australia. They are a funny lot.